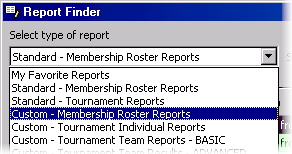 To load, create, edit, or delete a custom report, pull down the Reports menu and select Custom - Membership Roster Reports, Custom - Tournament Individual Reports or Custom - Tournament Team Reports - BASIC. There are several sample report layouts that you can use or experiment with. Custom - Membership Roster Reports. Extracts information from your membership roster. Each row consists of a player and his/her membership information, such as address, phone number, email, dues, etc. Custom - Tournament Individual Reports. Extracts information from the membership roster and active tournament. 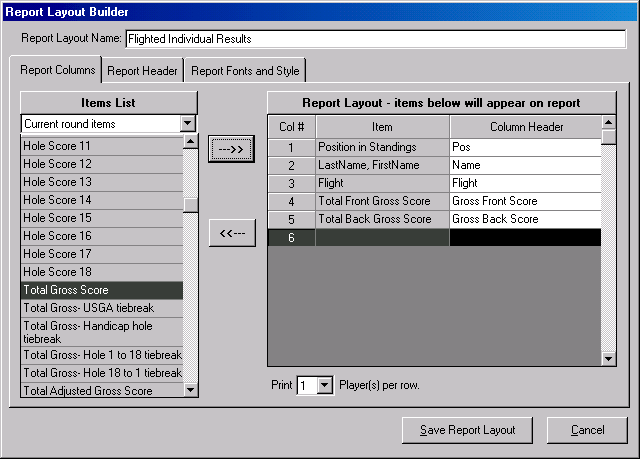 Each row consists of a player and his/her tournament information, such as teetime, start hole, handicap, team on , scoring results, etc. Custom - Tournament Team Reports - BASIC. Extracts information from the active tournament. Each row consists of a team and its tournament information, such as team name, sponsor, teetime, start hole, handicap, scoring results, etc. 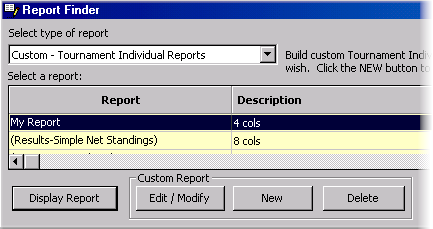 To display, create, edit or delete a custom report, select any of the custom reports types in the Report Finder and a list of custom reports will appear. Items are listed in different categories so that you can quickly find them. At the very top of the Items List you will notice a drop down list box. This box contains the different categories available. Select the items category you wish to view. For example, the category currently selected in the above sample screen is Current round items. See the list below for the different categories and items you can place on reports.